Good afternoon. It gives me great pleasure to join you at this employer luncheon hosted by Hong Kong Polytechnic University. As the Chairman of the Human Resources Planning Commission established by the current-term Hong Kong Special Administrative Region (HKSAR) Government, I am most pleased to see such a great turnout of faculty members and students of different disciplines, as well as executives and professionals from different industries coming together to share their insights on how we help shape our future talents. Hong Kong's human capital has all along been a major pillar underpinning the city's present-day success, and it will continue to be a key driver propelling Hong Kong's economic and social development. This term of the HKSAR Government has a clear vision to develop Hong Kong further into a high value-added and diversified economy. To this end, we need to develop a good mix of talents who have broad horizons, equipped with different skillsets and a solid grasp of international affairs, to sustain our competitiveness and contribute towards the diversified development of Hong Kong. ​It is with this vision in mind that the Human Resources Planning Commission was established last year under my chairmanship to examine, review, and co-ordinate policies and measures in a holistic manner, with a view to formulating a co-ordinated human resources planning strategy to facilitate Hong Kong's sustainable development in this ever-changing world. We must act swiftly, get prepared, identify opportunities and position Hong Kong as a key player in the global race, while rising to the challenges confronting us. ​Thanks to longer life expectancy and a lower fertility rate, Hong Kong is facing a rapidly ageing population. We now expect men in Hong Kong will live up to 81.7 years old and women to 87 years old. In 25 years' time, men in Hong Kong are expected to live up to 87 years old, and for women, 92.5 years old. We are now ranked first in life expectancy in the world. According to the latest projection, our local labour force is expected to reach a plateau from this year until 2022, and then begin to dwindle afterwards. The ageing trend implies that our highly productive labour force will soon begin to diminish. A shrinking labour force will inevitably have a significant bearing on our future economic development. ​Hong Kong is a small and externally oriented economy and is often exposed to risks caused by fierce competition and sweeping changes in the global market. In parallel, the irreversible trend of rapid innovation and technology development has swept across the globe and revolutionised business processes and activities. These paradigm shifts bring about profound and broad-based implications on our human resources. Some quarters of society have expressed that Hong Kong is facing a skills mismatch, where a shortfall of skilled local talents in high value-added industries has hindered the long-term development of Hong Kong. ​ Young people are our future. They possess immense potential to propel Hong Kong's economy forward and are the lifeblood of different sectors. The Human Resources Planning Commission is working at full steam to develop forward-looking strategies to nurture high-quality home-grown talents that will excel and move forward and upward. Education is the key to developing a talent pool to facilitate Hong Kong's development into a diverse, knowledge-based and technologically advanced economy. We believe that the Government's expenditure on education is the most meaningful and worthy investment in our future. Since assumption of office in July 2017, the current-term Government has injected a total of HK$8.3 billion additional recurrent resources into the education sector, of which a substantial portion was allocated to improve basic education including science, technology, engineering and mathematics (STEM) education in primary and secondary schools. ​We have also introduced a series of policy measures to improve access by our young people to higher education through multiple pathways including University Grants Committee (UGC)-funded universities and self-financing institutions, with a view to broadening our next generations’ visions and horizons and equipping them with professional skills that will help maintain their competitive edge and realise their potential in this new economic era. Since the implementation of the four-year undergraduate curriculum, our universities have devoted much effort in reorganising the curriculum to achieve our policy goal. The introduction of newly designed general education programmes, which now cover around 30 per cent of the entire curriculum, allows students to broaden their knowledge extensively across different subject areas and strengthen their creativity, leadership and communication skills. Such a whole-person education regime is fundamental to nurturing the all-round talents that are most sought after by industries. In addition, the UGC triennial funding exercise provides broad planning parameters, including specific manpower requirements and non-binding general manpower remarks to encourage universities to keep abreast of the latest manpower trends and social needs when considering allocation of course programmes. I am delighted to note that universities have responded positively to the Government's call for promoting innovation and technology and offered more cross-disciplinary programmes in the planning cycle, including programmes on artificial intelligence and financial technology. To provide multiple and flexible pathways for local students to pursue post-secondary education, the HKSAR Government has stepped up support for self-financing sub-degree programmes that nurture talents to meet our social and economic development needs. It is anticipated that about 4 000 students will benefit in each academic year. This initiative will incur HK$120 million additional recurrent expenditure each year. ​Vocational and professional education and training (VPET) allows young people an alternative pathway to traditional academic education. VPET has an important role in unleashing the potential of young people and enhancing the employability of working adults, and at the same time, attracting and retaining talents that suit the needs of relevant industries. The Vocational Training Council (VTC) offers 1 200 training places per year to enable trainees to join industries that require specialised skills under the "Earn & Learn" model. Furthermore, to encourage working adults in designated industries to pursue higher qualifications, the Government provides subsidies to cover tuition fees for students admitted to designated professionals part-time programmes offered by the VTC. ​The HKSAR Government also sees the need to attract and nurture more technology talent from other places to build a critical talent pool for driving innovation and technology development in Hong Kong. Noting the specific manpower need for emerging industries, particularly the innovation and technology sector, we launched the Technology Talent Admission Scheme in May last year to fast-track the admission of overseas and Mainland R&D talents to meet the talent demand by the sector. ​We further rolled out the Technology Talent Scheme last August to subsidise research institutions and enterprises to recruit talents to carry out R&D activities and train their existing staff to apply advanced technology to add value to their businesses. To nurture our local talents to be involved in R&D, we will also provide tuition fee waiver for all local students enrolled in UGC-funded research postgraduate programmes from this academic year onward. ​As for our existing workforce, we encourage them to pursue continuing education to help them keep abreast of the latest technological advancement, professional standards and career path, thereby strengthening their adaptability and resilience to the ever-changing economy. To this end, the HKSAR Government has injected HK$10 billion into the Continuing Education Fund to support the implementation of various enhancement measures to promote lifelong learning, enrich job skills for the rapidly changing environment. ​In addition, the Towngas Engineering Academy of the Hong Kong and China Gas Company Limited, and the CLP Power Academy of the CLP Power Hong Kong Limited, offer recognised professional courses for young people who are interested in gas, electrical and engineering work. To train more high-calibre construction practitioners and raise the professional image of the construction industry, the Hong Kong Institute of Construction was set up last year to offer a wide range of construction courses, including diploma courses accredited at Qualifications Framework Level 3 to provide students the opportunity to receive professional training, and at the same time obtain recognised qualifications in a progressive manner. ​Ladies and gentlemen, the Government also strives to enrich students' learning experiences by broadening their horizons through internships, work attachments and exchange opportunities in Hong Kong, on the Mainland and other places overseas. We are taking the lead to organise, fund and co-ordinate with education institutions and the business community to enable an average of 70 000 young people to participate in internships and exchange programmes each year. ​To strengthen our efforts, we are forging partnerships with 16 locally based major corporations to launch the Scheme on Corporate Summer Internship on the Mainland and Overseas. The Scheme aims at providing quality internship opportunities for university students to explore opportunities outside Hong Kong. Over 230 young students have benefited from these experiential learning opportunities. This is the first time for the Government to take such an active role as a facilitator and promoter to collaborate with the business sector in providing these internship placements. In view of the positive responses gained in the pilot scheme, we will expand the Scheme this year to provide more internship opportunities on the Mainland, countries along Belt and Road corridors and beyond. Taking advantage of this gathering of business leaders today, I would like to appeal to you all to join the Scheme and offer more work placements to our young people. ​To assist young people in participating actively in innovation and entrepreneurship, the HKSAR Government has stepped up support to provide young entrepreneurs with financial subsidy through the Entrepreneurship Matching Fund. We have also made considerable efforts in promoting tripartite partnership among the private sector, non-governmental organisations and the Government to provide work space at concessionary rental at almost two-thirds of market rent through the Space Sharing Scheme for Youth, to provide guidance and strengthen support for our young people. ​Having gone to great lengths on how Hong Kong nurtures talents and creates synergies between the education sector and employers, I would like to end my speech by addressing the younger audience here. You are the future of Hong Kong. Your unique talents and aspirations fuel the vibrant and diverse development of this Asia's world city. The Government strives to open as many doors as possible to you all to realise your dreams and seize opportunities for upward mobility. ​We treasure your views and are eager to bring your voices into the Government. To encourage participation of young people in policy discussion and debate, we introduced a pilot scheme in 2017 to recruit self-recommended young members to five advisory committees and received overwhelming responses from our young people. Given this roaring start, we have regularised the scheme and Phase I of the Member Self-recommendation Scheme for Youth was introduced in June last year, and successfully recruited more than 30 young members appointed for 15 committees. The second phase of the Member Self-recommendation Scheme for Youth has just been launched, and I strongly encourage you to join the Scheme to contribute to the betterment of the community and bring your voices into the Government. ​Ladies and gentlemen, Hong Kong plays a pivotal role in our country's strategic initiatives including the Belt and Road Initiative and the Guangdong-Hong Kong-Macao Bay Area development. We have signed the ASEAN Trade Pact that will provide boundless opportunities for Hong Kong's talent. But Government's efforts alone are not enough. We need all sectors of society to join hands to help nurture a pool of talents for developing Hong Kong into a high value-added and diversified economy. ​The year 2019 has just begun. In face of the cloudy international trade environment, coupled with the rise of unilateralism and trade frictions between the two largest economies worldwide, Hong Kong people's flexibility, perseverance and courage to face the challenges will help us surmount all difficulties, seize the opportunities and move towards a brighter future. 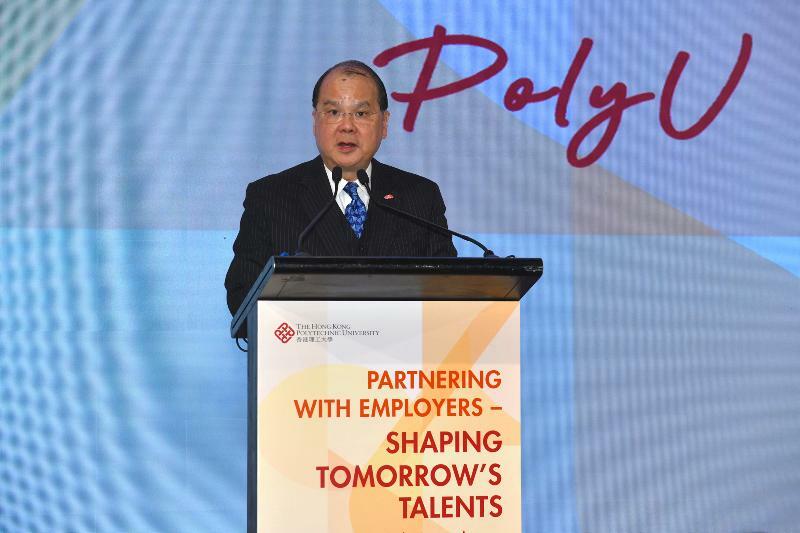 ​On this note, I wish Hong Kong Polytechnic University continuous success, and am confident that Poly U's partnership with the Government and the business community will go from strength to strength, and that the graduates will excel on all fronts. I also wish you all a happy, healthy, harmonious and prosperous 2019. 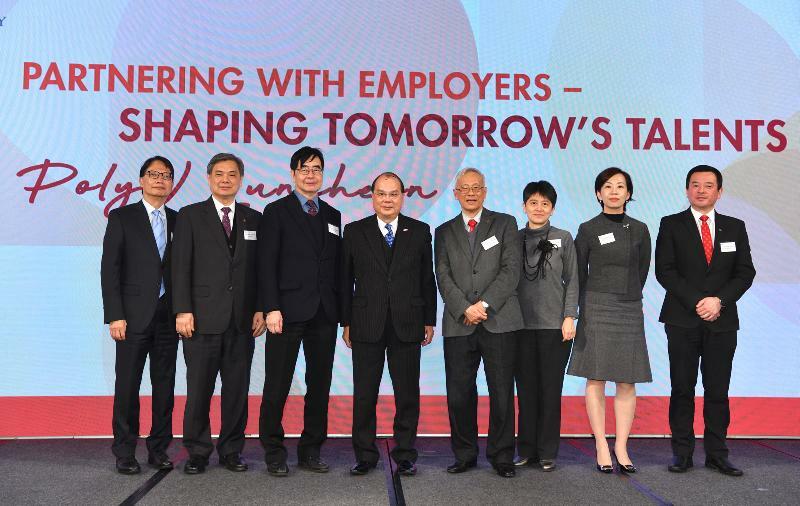 CS attends PolyU Luncheon "Partnering with Employers – Shaping Tomorrow's Talents"